BRAND NEW IN BOXCARD PAYMENTS TAKEN! REVERSE GEARELECTRIC STARTNO MIXINGINCREDIBLE 4-STROKE ENGINE! 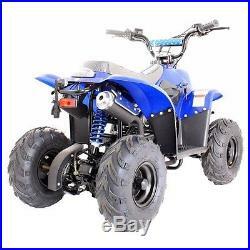 These 110cc Quad Bikes have more power and are intended for older kids or more experienced youngsters and adults as they can carry a massive 150kg. Although the power can be restricted when necessary, having more power available when required means they will not be outgrown and therefore last longer making this quad a good longer-term investment. 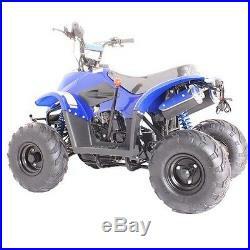 We have a wide range of Quad Bikes and Mini Quads all built to European safety standards. Whether for just mucking about down the lanes and across the fields or for competition use these quality Quads are now available at a really affordable price. Your kids cannot fail to be impressed by the performance of these machines. Quality built to European safety standards these 110cc Quad Bikes not only look fabulous but have all the features you need for a proper Quad. First it has the power, the 110cc engine extends the appeal of this Quad to older children, there is nothing more disappointing than to find that the Quad which seemed to have plenty of power when you first started driving now simply wont deliver as you get more skilled and need to push it harder. The 110cc Quad bike has much more power and torque, enough in fact to propel most adults, but dont forget this can be restricted for those who need it. 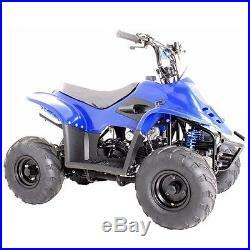 So as your child gains abilities they wont outgrow this Quads abilities, making this bike a good longer-term investment. 110CC, Four stroke Auto (Rev n Go) with very important Reverse Gear. Fully Enclosed Safety Foot Wells. With front double drum brake + rear Hydraulic disc brake. With full chain cover for safety. With front double suspension + rear single suspension. This model is fully factory built and Ready To Run. Some minor assembly may be required to refit some small items that may have been removed to enable the bike to fit in the packaging, such as the footrests, or items that have been packaged separately to avoid damage in transit such as screens. All thats needed is unleaded petrol. We recommend the rider wears safety gear like a helmet, goggles and gloves. All the models, accessories and spares we sell are brand new and unused in the original manufacturers packaging and the latest specification. Please note customers will be expected to fit the parts themselves, guidance will be available on technical issues. Photos required within 24 hours of receipt. Pull Starts or Inner Cogs. Brake Cables, Disks and Callipers. Tyres, Wheels, valves and Inner Tubes. Any other parts of a similar wear and tear nature to those listed above and any part that has been damaged as a result of an accident, misuse or lack of maintenance. CARD PAYMENTS TAKENCALL US ON 07949 443499. 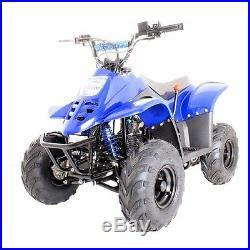 The item "110cc THUNDER CAT PETROL QUAD BIKE FOR TEENS/KIDSNEWBLUE2016" is in sale since Sunday, January 24, 2016. This item is in the category "Toys & Games\Outdoor Toys & Activities\Other Outdoor Toys/ Activities". The seller is "bryntecsales" and is located in Bolton, Lancashire. This item can be shipped to United Kingdom, to Austria, to Belgium, BG, HR, CY, CZ, DK, FI, to France, to Germany, GR, HU, to Ireland, to Italy, LT, LU, MT, to Netherlands, PL, PT, RO, SK, SI, to Spain, SE, to Australia, to United States, RU, to Canada, to Japan, to New Zealand, to China, IL, to Hong Kong, NO, ID, MY, to Mexico, SG, KR, to Switzerland, to Taiwan, TH, TR.